The main and perhaps the principal idea of all gambling systems and any baccarat strategy is to help players make fast choices when playing for real money without the need to worry about each next bet over and over. In order to make the system trustworthy and at least not a losing one, lots of professionals have created mathematically correct systems that help you to end up a winner. Baccarat systems just like the baccarat tips are aimed at increasing player profits when he is winning and decreasing the possible loss when he is losing. There are lots of betting systems, therefore let's consider the most popular ones. The basic principle of Paroli betting system is positive progression. The player starts with one betting unit and in case of a win doubles the next bet. In case of a loss the player starts all over with 1 betting unit. However, it is advisable to set a maximum bet limit before applying this betting system. Pros: The biggest pro in this system is the fact that you do not have to bet huge amounts of money on a single bet by setting a betting limit. Being another example of a positive progression just like the Paroli betting system, Parlay betting system is mostly used in horse race betting. 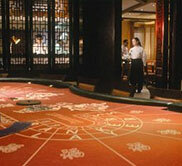 Still, it is quite good for online casino baccarat too. The basic principle of this system is the fact that the player in case of a win uses the original bet and the money won on the hand to place the next bet. Pros: Parlay betting system does not involve great risk as the player may set a betting limit and controls the amount he bets. Martingale betting system is perhaps the most known among online gamblers. The system is a negative progression based on high probability of player losing several times in a row. The player bets one unit, in case of a loss he doubles the bet and bets again and so on until he wins. Each time the player wins he/she starts all over from 1 unit. The main idea of this system is the fact that the player ends up with a win of 1 betting unit. Pros: Martingale betting system is in fact a highly risky system as it requires doubling the initial wager each time the player loses. The risk can be huge as the player can lose several times in a row. D'Alembert betting system is a twisted positive progression. The player has to raise the bet by one unit after he loses and decrease it by one unit when he wins. NOTE: This betting system is unfortunately proven to be a mathematically losing one, therefore it is not recommended that you use it all the time. Also known by the names "Cancellation", "Crossout", "Labby", "Split Martingale", the Labouchere betting system is a negative progression. In order to use this system, the player writes a sequence of 6-8 numbers like 1 3 2 4 5 4 5. The first bet is the sum of the first and last numbers in this sequence (in this case 1+5=6). If the player wins the bet he crosses out the used numbers from the sequence and goes on (in this case 3+4=7). As soon as the betting cycle is completed (you have crossed out all the numbers) you start all over from the very beginning. Each time you lose you write the number of units of your first bet (6 in our case) to the end of the row and now the row is larger. Pros: LabouchÃ¨re betting system will always turn a profit after the player completes the cycle and wins all the bets. Note: The above mentioned betting systems are applied for even money bets only. Therefore, it is better to use these systems for player bets as banker bets pay with a 5% casino commission.